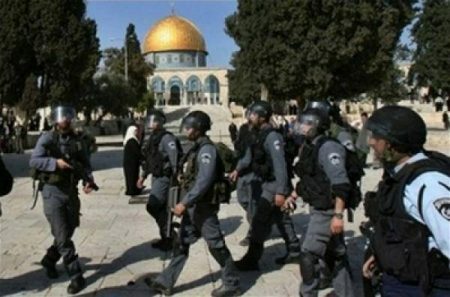 Groups of Jewish extremist settlers, early Monday, stormed Al-Aqsa Mosque compound in the occupied city of Jerusalem, a Palestinian source confirmed, according to Al Ray. The General Director of the Islamic Awqaf and Al-Aqsa Affairs, Sheikh Azzam Al-Khatib, said that today’s raid was carried under heavy protection of Israeli special police. The settlers received explanations about the alleged “Temple Mount”, during their tour, where some of them tried to perform Talmudic rituals in the courtyards, he explained. Al-Khatib noted that the settlers provocatively toured the compound and performed their ritual amid a state of anger among Muslim worshipers and students.